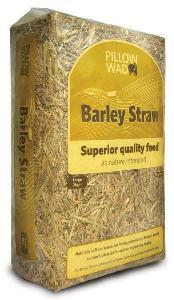 Pillow Wad Barley Straw selects only the finest quality golden barley straw. Using their years of experience and connections with local farmers they are able to harvest their premier produce. Barley straw is the naturally softest of all the straw types with the lowest dust content it is a natural product that has been used for centuries. It's dust is extracted and sieved to make it more palatable. The straw is left in the longer stands for the same reasonas the hay to maintain nutrient levels and benefit dental wear.